Providence, R.I. – The reviews are in for Jennifer Dorn ’18 — and they’re unanimously positive. The double major in English and theatre arts has been selected to teach for a year in the Czech Republic through the Fulbright English Teaching Assistant Program — and she has won a national award for theatre criticism, too. Dorn, who lives in Dallas, Texas, is the 11th Providence College student since 2011 to receive an award from the Fulbright Program, the flagship international exchange program of the U.S. government. Each year, the program sends 1,700 scholars to more than 155 countries to study, research, or teach. Three PC alumni also have been Fulbright recipients, including one this year: Susan Malone ’13, who also will teach in the Czech Republic. It has been an exciting final semester for Dorn. 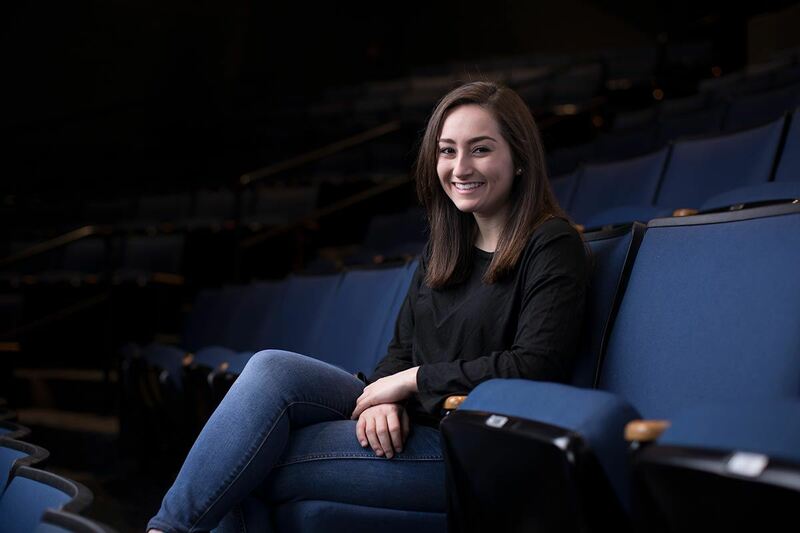 In April, during the Kennedy Center American College Theater Festival in Washington, D.C., she won the Institute for Theatre Journalism and Advocacy Scholarship. She was awarded a full fellowship to attend the National Playwrights Conference at the Eugene O’Neill Theater Center in Waterford, Conn., from July 1-15. While there, she will work with newspaper and magazine critics from across the United States. Dorn believes her involvement in theatre arts helped her achieve the Fulbright. The secondary school in which she will teach English has a drama club, and she will work with its students. “I think theatre played a huge role, for anyone who might think a theatre major isn’t worthwhile,” Dorn said. Dorn acted in seven theater performances at PC and was a crew member on three more. Her acting credits are A Midsummer Night’s Dream, Blithe Spirit, Hamlet, Into the Woods, The 25th Annual Putnam County Spelling Bee, The Addams Family Musical, and What Dreams May Come: A Musical Revue. James M. Calitri, assistant professor of theatre, said the list demonstrates her range and strength in musicals, comedies, and drama. For her senior capstone project, Dorn directed students in Lend Me Thy Hand to Laugh a Little: An Exploration of Shakespearean Comedy, a series of scenes from Shakespearean plays. Shakespeare is her favorite — a fitting choice for someone who also majored in English and loves to write. Dorn learned to write criticism in U.S. Fiction Since 1960, a course taught by Dr. Eric D. Bennett, associate professor of English. Instead of composing academic papers, students wrote reviews of the books they read. Dorn, who considers herself a stickler on grammar, served as a copy editor for the student newspaper, The Cowl, for four years. Each year, the Kennedy Center American College Theatre Festival hosts eight regional competitions in which 18,000 students from more than 600 colleges and universities compete in acting, playwriting, directing, design, and criticism. At the regional festival at Western Connecticut State University in February, Dorn wrote reviews of student productions, and her work was judged the best. From the eight regional competitions, only four students were selected to compete in Washington. Dorn was the youngest, and the only woman. In Washington, Dorn learned from professional critics, including Sarah L. Kaufman, dance critic for The Washington Post and winner of the 2010 Pulitzer Prize for criticism; Bob Mondello, art critic for NPR; and Chris Jones, chief theater critic for the Chicago Tribune. Each night, she attended a professional performance, then returned to her hotel room to write a 600-word review on deadline. She reviewed Translations by Brian Friel at the Studio Theatre, Paper Dolls at the Mosaic Theater Company, and The Wiz at Ford’s Theatre. Each afternoon, she met the critics to receive feedback. On the final night of the festival, on stage at the John F. Kennedy Center for the Performing Arts, Dorn was named the national winner for theatre criticism. Dorn credits her parents with teaching her and three younger brothers to appreciate the arts. She began acting at age 8 at the Jewish Community Center a few blocks from her home. When it came time for college, she wanted to study on the East Coast. She visited PC because it was founded and staffed by the Dominican Order, which also ran her high school. A scholarship and the opportunity to study in the Liberal Arts Honors Program convinced her to attend. It was the honors program director, Dr. Stephen J. Lynch, professor of English, who suggested during her first year at PC that she might want to apply for a Fulbright before graduation. At the end of junior year, she was the first student to approach Dr. Darra Mulderry, director of national and international fellowships in the Center for Engaged Learning, for information. Dorn spent the summer in Providence working for the Office of Admission and worked on her Fulbright application and personal statement. She has traveled internationally before, to Spain and Portugal with the honors program, and to Italy for a semester through the PC in Rome program. She also has been selected previously for a post-graduate opportunity. After graduating, Dorn was supposed to spend two years with Teach For America in Tulsa, Okla. She was able to defer the assignment for one year, until she returns from the Czech Republic in 2019.